Until very recently, journalists and politicians in the rUK were dismissing Scottish independence as something that clearly would never happen, so no planning was necessary. Things are starting to change, however. Two of today’s news stories were examples that people south of the border are starting to wake up to the fact that Scotland might vote Yes next year. Now, the prospect of Scotland leaving the United Kingdom throws open the question again. It’s already been suggested by the College of Arms that with the Queen still head of state of an independent Scotland there would be no need for a redesign. But there is still the possibility of renewed debate. “It was created at the time of the union of the crowns,” he says – as opposed to full political union, which did not happen for another 100 years. Since the movement for Scottish independence proposes to retain the British monarchy, redefining the flag in the event of a Yes vote would not make sense, says Rosindell. It sounds a bit strange. Are they saying they can only use the Union Jack so long as Scotland remains a monarchy? Surely they’d want a flag they could use no matter what Scotland decides to do in the future? Anyway, that’s their problem. If they want the Union Jack, they can keep it. The second news story was about the threat to Britain as a global brand if Scotland leaves. Scottish newspapers (such as The Herald) decided to portray it as yet another bit of scaremongering, claiming it’d be bad for Scotland, too. Ireland and Scotland are widely acknowledged as having created country brands that punch far above their natural weight. Part of the reason for this is that they are in the so-called ‘tiger club’, small, cocky fighters who use the illusion of an enduring enemy to create a strong brand identity for themselves as the underdog. In the case of Scotland for instance they even used an advertising line called ‘Scotland the Brand’ (replacing Scotland the brave), also, the Scottish Culture Board has sent Hollywood a training course in Scottish dialect to make sure that authentic accents are the only ones we hear on the big screen (the end of ‘Scottie’ from Star Trek perhaps). It’s therefore clear they’re worried about themselves, not about Scotland. It appears the rUK are currently working their way through the well-known five stages of grief (denial — anger — bargaining — depression — acceptance). I would say they’re currently progressing from denial to anger (“You can’t take our flag! You can’t ruin our brand!”). It’s good to see they’re slowly getting to terms with it. The Union Jack has become a fashion item around the world — having a Union Jack iPad cover in Thailand, for example, doesn’t mean you have any particular attachment to the UK. It’s become a design element. I don’t think it will stop being a design element. The combined populations of the non-English part of ‘rUK’ is about 4m. The population of England is 53m. Ulster’s flag is the English flag with a red hand in the middle. The St Patrick’s saltire was more relevant to when the whole island of Ireland was part of the UK. 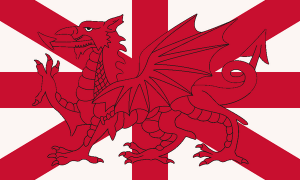 There’s currently no Welsh bit in the UK flag. So I think we could get away with using the St George flag. Apparently N.I. hasn’t had an official flag since 1972! Ulster is more Scottish than English — it makes sense for them to be part of Scotland anyway. Exactly – they even have radio channels in Scots and we don’t – it’s insane – sounds a bit like my old Gramps speaking when you listen to them. So then ‘rUK’ will be 53m English and 3m Welsh. It’s an emotional journey more than a logical one. Is it dear to go to uni in NZ?